The butcher's knife is undoubtedly one of the essential accessories for this profession for whom cutting has become an art. Admittedly, as the saying goes 'a bad workman always blames his tools', but the fact remains that good workers and good tools often go hand in hand! Whether in professional kitchens or at home, this butcher's tool with a very sharp blade is often put to the test. 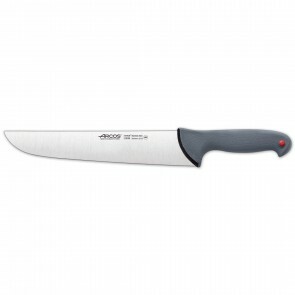 It is used for deboning, and cutting all types of meats, raw or cooked. It is therefore essential to equip professional quality knives with a solid handle and blade that will withstand shocks, wear and oxidation. Did you say butcher knife? Hunting knife, fillet knives, bread knife, fish knife, paring knife and steak knife: for each knife a application that corresponds to its shape and size. The butcher knife has a thin slightly curved blade which allows to cut into slices of regular thickness at one hit. Its shape is quite similar to the chef's knife. The ergonomic handle allows secure handling and handiness. It is used for cutting raw and cooked meat. It is usually used with other professional knives such as chopping knives, skinning knives, boning knives, meat grinders and butcher's saws in a butchery and professional kitchens. You can also add it to your cookware since the butcher knife is also perfectly suited for household use. How to choose your butcher knife and maintain it? For a professional knife we always recommend a stainless-steel blade. The stainless-steel blade is not only endowed with a high resistance to corrosion but also to abrasion, a sine qua non criterion for a set of professional quality knives. This resistance to abrasion is specially using for sharpening these kitchen utensils. 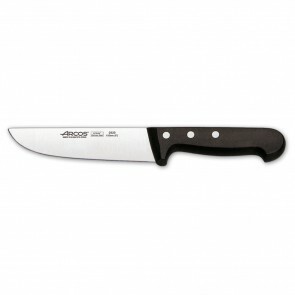 The handle of your butcher knife must be specially designed for safe and comfortable handling. The handle of your butcher knife must have a safety guard to prevent your hand from coming in contact with the blade. Whether it has a wooden or plastic handle, a perfect sealing is essential for a perfect food hygiene. In order to allow you to comply with health standards, AZ Boutique offers not only knives with perfectly sealed handles but features color-coded professional grade knives which comply to HACCP regulations. To avoid the risk of food poisoning, fresh fish, raw meat, fruits and vegetables must be treated with different knives. The handle of our HACCP knives has a hole where you can slide a color pellet that matches a coding system. The use of this coding system avoids the exchange of knives in a butchery or professional kitchen. AZ boutique features a whole range of cutting and cutlery items from prestigious brands such as Victorinox and Arcos for both professionals and individuals. 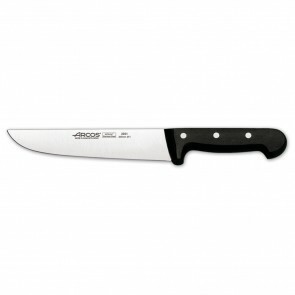 Our butcher knives are made of stainless steel and are thus of excellent quality and incredibly durable. Do not worry about rust problems for your cutlery! 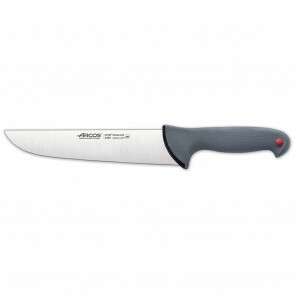 Opt for an excellent quality butcher knife. 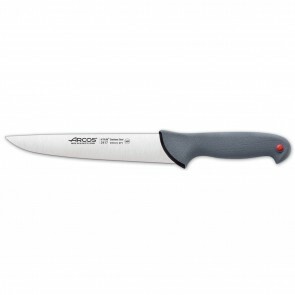 Find an array of knives including: bleeding knife, carving knife, slicing knife, Japanese knives, boning knives, steak knife, cleaver knife, cheese knives, Swiss army knife, fillet and paring knives.